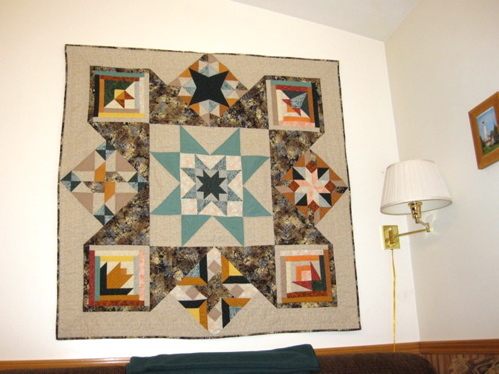 The Mystery Quilt that was begun in December, 2007 was hung in the Cute Little House on March 28, 2011. A certain e-mailing spouse sent this photo and a couple of others to several hundred of his closest e-mail buddies but apparently not to all the crackpots, so here it is. Now all I have to do is decide what colors to paint the walls. This entry was posted on Thursday, April 28th, 2011 at 3:54 pm and is filed under Mystery Quilt, Quilting Projects. You can follow any responses to this entry through the RSS 2.0 feed. You can skip to the end and leave a response. Pinging is currently not allowed.